The DIY tornado has landed around here, with power tools, building materials, and plastic tarp serving as the current dining room decor. 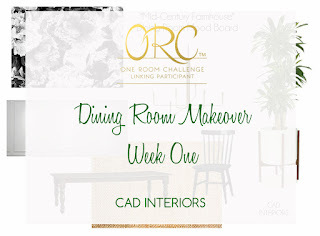 Thanks to the One Room Challenge, our dining room makeover is moving right along! We are definitely in the messy and chaotic stage of the process. We were away on vacation this past week, so I've been playing a little catch up in the room. 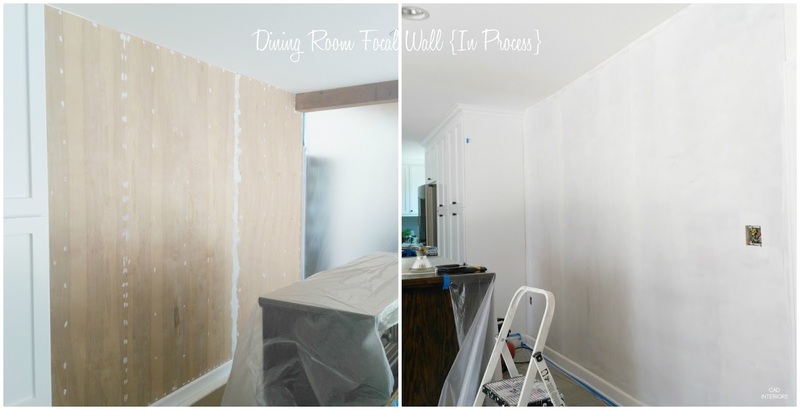 BUT before we left, my hubby and I had ripped apart the dining area in preparation for the room's main design feature: a focal wall. There is one "real" wall in the space, and it is only 11 feet long. 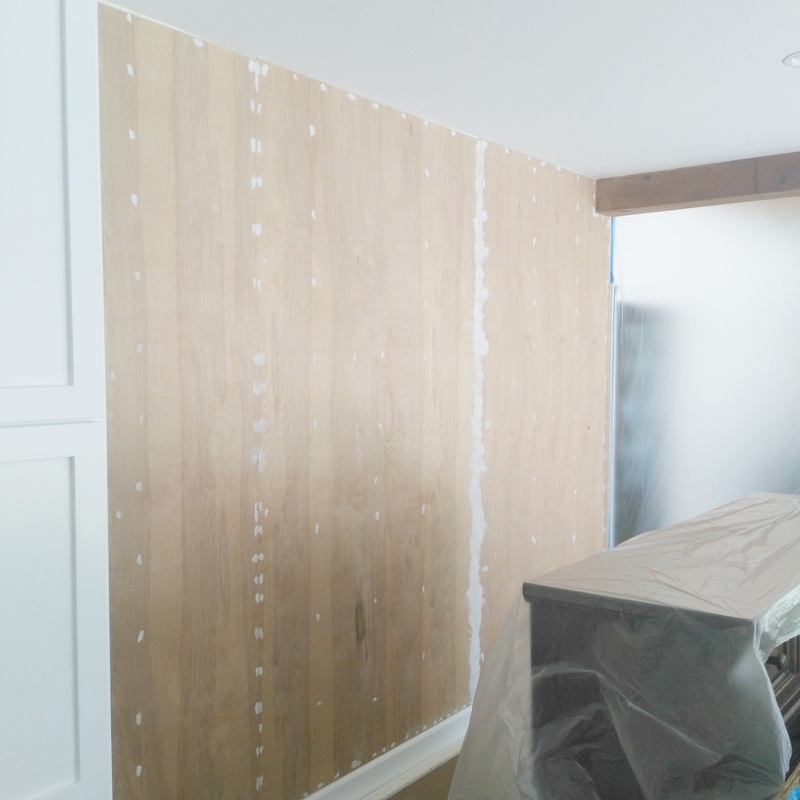 The plan is to clad the wall with wainscoting and wallpaper to give the room some architectural dimension and design interest. The focal wall will also help define the area as its own space (since it is not a separate room). We spackled, filled, and sanded all the nail holes and seams. 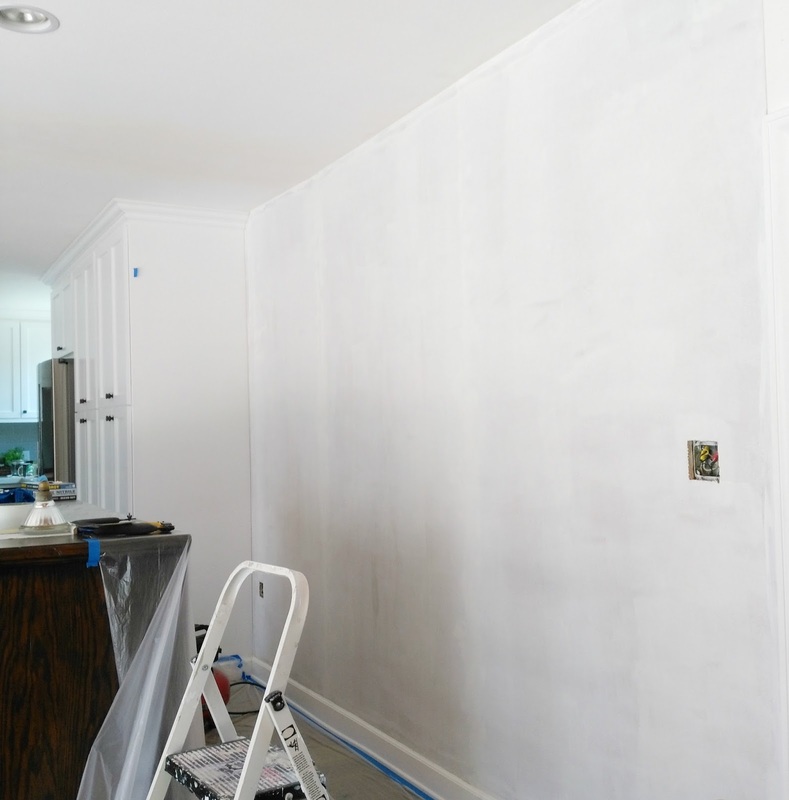 The paneling has also been primed (and painted since the above photo was taken). 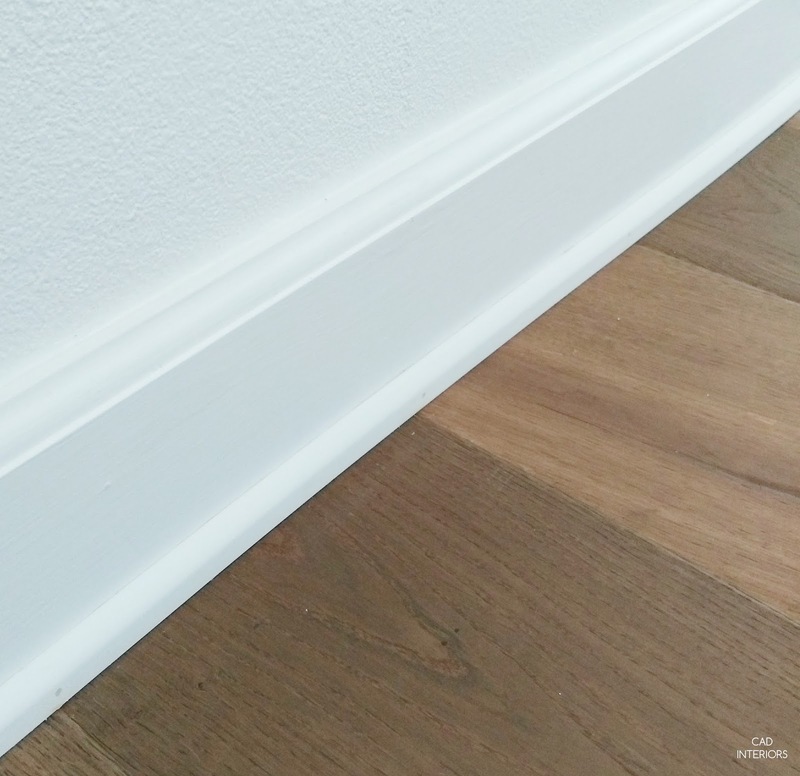 My hubby also added base shoe molding to cover the minor gap between the baseboard and hardwood floor. Next step in the makeover will be installing the chair rail and trim molding then more nail filling, sanding, etc. The light fixture is also scheduled to arrive next week, so I'm hoping my hubby will be able to install it shortly thereafter. Follow me on Instagram @cadinteriors for sneak peeks and updates! Is that your final choice of wallpaper? Ultra dramatic! Are textured walls some kind of old trend? It would be a real hassle to have to fix every time you have a hole to fill, or in your case, being able to wallpaper or apply molding. Don't you love filling nail holes? Its the one thing I always forget about carpentry work and then I'm cursing that I didn't pay a carpenter more to do it for me! I'm in the process of filling and sanding on some shiplap in our house before the painters arrive tomorrow :(. 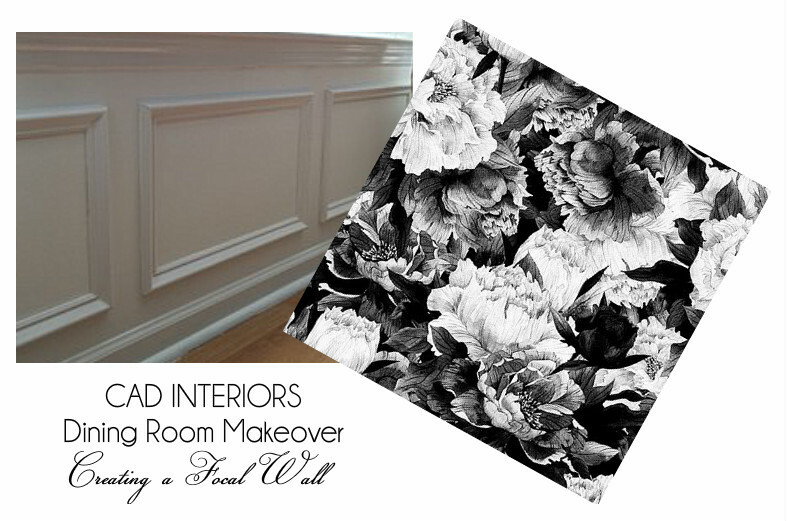 I love the idea of the wallpaper on that wall- will look fantastic! Thanks for the vote of confidence on the wallpaper! Can't wait to see my husband's face once I put it up. Ha! My fingers haven't fallen off from filling holes yet, thank goodness. I have a real appreciation for carpentry work. :) Oooh, can't wait to see the shiplap! Can't wait to see that wallpaper go up, it's going to be amazing! Carol I adore the direction that your room is headed towards! You did SO much better than I did in my room this week. Thank you, Laura! There are so many ORC participants, so it helps when people like you stop by and leave a comment to let me know about their room. :) I'll be heading over to your blog! And thanks for letting me know about the link up. I had no idea! I love your design plan and can't wait to see next week's update! The shoe moulding was a great idea and solution.